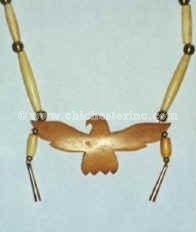 These necklaces are assembled from non-Native components by Iroquoian artisans in either the United States or Canada. This necklace comes bagged with a card describing how Native Americans used arrowheads to obtain food, shelter, and clothing. The tea-stained turtle pendant hangs on a 25" (63.5 cm) wax cotton neck strap with water buffalo bone hairpipe and silver-colored beads. The pendants are made from cow bone. Genus and species of water buffalo: Bubalus bubalis. Ranch. 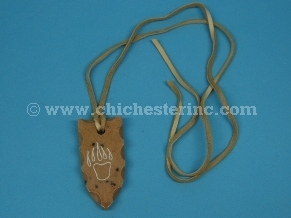 The tea-stained bear pendant hangs on a 24.5" (62 cm) wax cotton neck strap with water buffalo bone hairpipe and silver-colored beads. The pendants are made from cow bone. 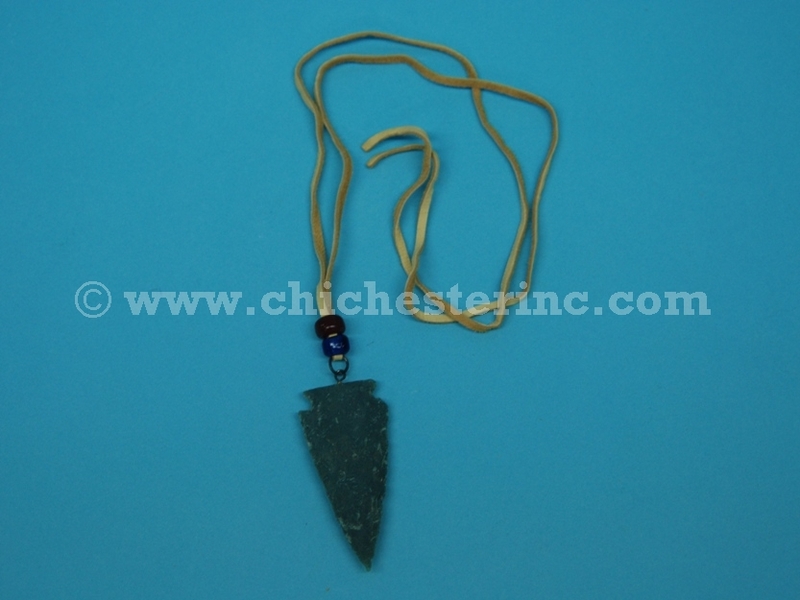 The 1-Antler Tip Necklace is decorated with a glass bead on a 32” deerskin neck strap. Antler tips range from 1” to 4” long and bead color varies. The necklaces come with an authenticity card that describes the importance of the deer to Native Americans. The wolf pendant hangs on a 22" (56 cm) waxed cotton neck strap with water buffalo bone hairpipe and silver-colored beads. The pendants are made from cow bone. The wolf track pendant hangs on a 23.5" (60 cm) waxed cotton neck strap with water buffalo bone hairpipe and silver-colored beads. The pendants are made from cow bone. The pendant hangs on a 30" (76 cm) cow split neck strap. The pendant hangs on a 29" (73.5 cm) cow split neck strap. The pendant hangs on a 30.5" (77.5 cm) cow split neck strap. The pendant hangs on a 28.5" (72.5 cm) cow split neck strap. The pendant hangs on a 33" cow split neck strap. Each necklace comes on a card describing how Natives Americans used arrowheads to obtain food, shelter, and clothing. 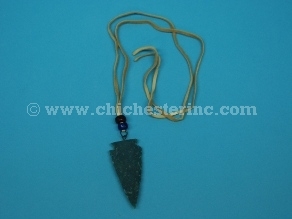 The pendant hangs on a deerskin neck strap. 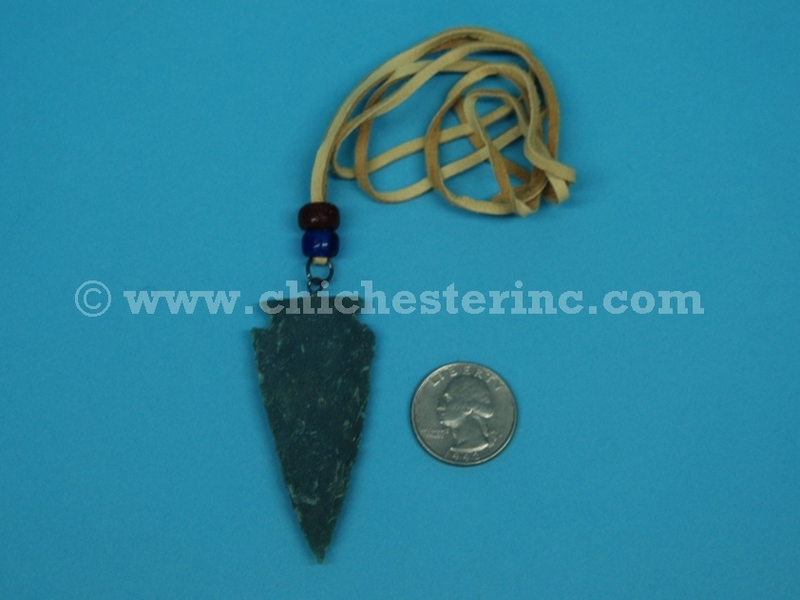 The soapstone arrowheads have assorted native designs carved on them. 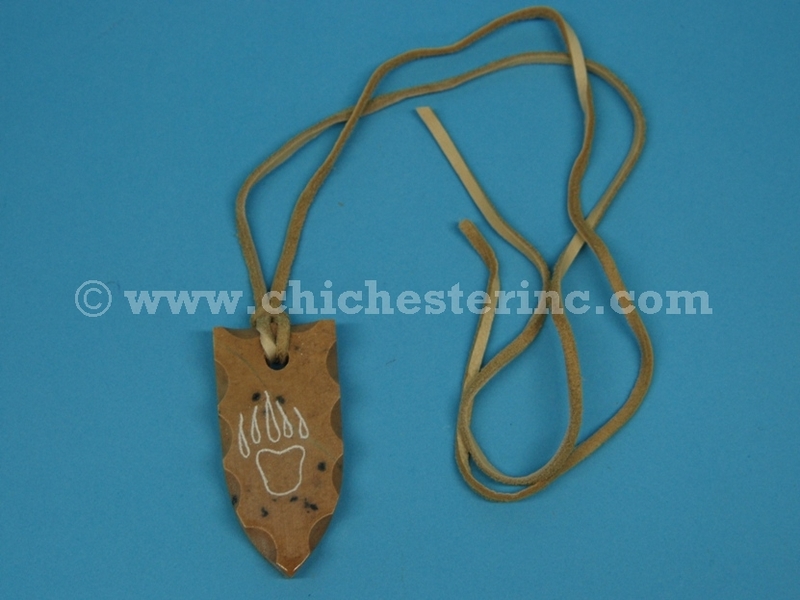 the pendant hangs on a deerskin neckstrap. These "Onondaga" arrowheads have the tree of peace carved on them. 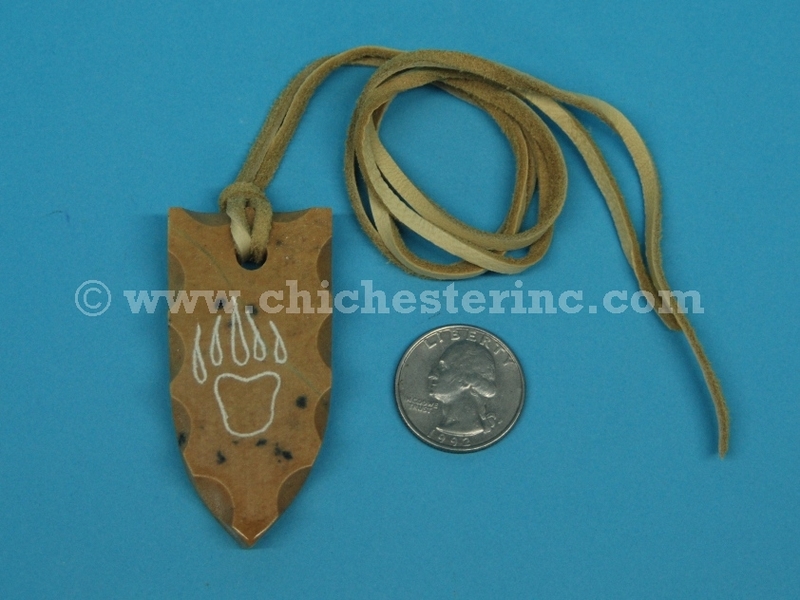 The pendant hangs on a deerskin neckstrap. 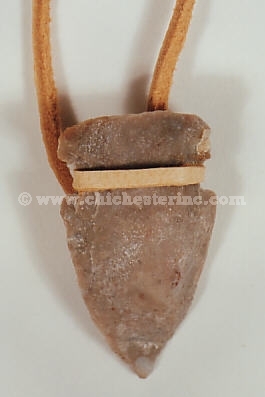 The flint arrowhead with bail is hung on a deerskin neckstrap.